On Sunday (September 16, 2018) Eliud Kipchoge ran the Berlin Marathon in 2:01:39, smashing the previous world record by more than a minute and taking a substantial step in the progression toward a two hour marathon. 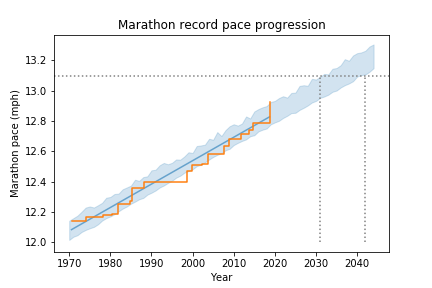 In a previous article, I noted that the marathon record pace since 1970 has been progressing linearly over time, and I proposed a model that explains why we might expect it to continue. Based on a linear extrapolation of the data so far, I predicted that someone would break the two hour barrier in 2041, plus or minus a few years. Now it is time to update my predictions in light of the new record. The following figure shows the progression of world record pace since 1970 (orange line), a linear fit to the data (blue line) and a 90% predictive confidence interval (shaded area). The dashed lines show the two hour marathon pace (13.1 mph) and lower and upper bounds for the year we will reach it. Since the previous record was broken in 2014, we have been slightly behind the long-term trend. But the new record more than makes up for it, putting us at the upper edge of the predictive interval. This model predicts that we might see a two hour marathon as early as 2031, and probably will before 2041. Note that this model is based on data from races. It is possible that we will see a two hour marathon sooner in under time trial conditions, as in the Nike Breaking2 project. Suppose I have a box that contains one each of 4-sided, 6-sided, 8-sided, and 12-sided dice. I choose a die at random, and roll it twice without letting you see the die or the outcome. I report that I got the same outcome on both rolls. 1) What is the posterior probability that I rolled each of the dice? 2) If I roll the same die again, what is the probability that I get the same outcome a third time? You can see the complete solution in this Jupyter notebook, or read the HTML version here. Here's a BayesTable that represents the four hypothetical dice. Since we didn't specify prior probabilities, the default value is equal priors for all hypotheses. They don't have to be normalized, because we have to normalize the posteriors anyway. Now we can specify the likelihoods: if a die has n sides, the chance of getting the same outcome twice is 1/n. The 4-sided die is most likely because you are more likely to get doubles on a 4-sided die than on a 6-, 8-, or 12- sided die. The second part of the problem asks for the (posterior predictive) probability of getting the same outcome a third time, if we roll the same die again. If the die has n sides, the probability of getting the same value again is 1/n, which should look familiar. The first term is the posterior probability; the second term is 1/n. 1) Creating a new table with the posteriors from table. 2) Adding the likelihood of getting the same outcome a third time. 3) Computing the normalizing constant. This result is the same as the posterior after seeing the same outcome three times. This example demonstrates a general truth: to compute the predictive probability of an event, you can pretend you saw the event, do a Bayesian update, and record the normalizing constant. Bungee jumping turns out to be more complicated than I realized. I use bungee jumping as an example in Modeling and Simulation in Python, which I am revising this summer. The book is not done, but you can see the current draft here. During the first phase of the jump, before the cord is fully extended, I treat the jumper as if they are in free fall, including the effect of gravity and air resistance, but ignoring the interaction between the jumper and the cord. It turns out that this interaction is non-negligible. As the cord drops from its folded initial condition to its extended final condition, it loses potential energy. Where does that energy go? It is transferred to the jumper! where a is the net acceleration of the jumper, g is acceleration due to gravity, v is the velocity of the jumper, y is the position of the jumper relative to the starting point, L is the length of the cord, and μ is the mass ratio of the cord and jumper. For a bungee jumper with mass 75 kg, I've computed the trajectory of a jumper with and without the effect of the cord. The difference is more than two meters, which could be the difference between a successful jump and a bad day. The details are in this Jupyter notebook. For most of my books, I provide a Python module that defines the functions and objects I use in the book. That makes some people angry. where CosSignal and SinSignal are custom classes, not functions, which inherits four separate classes, NONE of which are necessary, and all of which serve to make things more complex than necessary, on the pretense this makes things easier. The classes these class inherit are a generic Sinusoid and SumSignal classes, which inherits a Signal class, which depends on a Wave class, which performs plotting using pyplot in matplotlib. None of which make anything really any easier, but does serve to hide a lot of basic functionality, like hiding how to use numpy, matplotlib, and pyplot. In short, just to get through the first two pages, you have to have access to github to import their ridiculous thinkdsp, thinkplot, and thinkstats, totalling around 5500 lines of code, or you are just screwed and can't use this book. All decent teaching books develops code you need as necessary and do NOT require half a dozen files with thousands of lines of custom code just to get to page 2. What kind of clown does this when trying to write a book to show how to do basic signal processing? Someone not interested in teaching you DSP, but trying to show off their subpar programming skills by adding unnecessary complexity (a sure sign of a basic programmer, not a good). The authors openly admit their custom code is nothing more than wrappers in numpy and scipy, so the authors KNEW they were writing a crappy book and filling it with a LOT of unnecessary complexity. Bad code is bad code. Using bad code to teach makes bad teaching. It's obvious Allen B. Downey has spent his career in academia, where writing quality code doesn't matter. Well, at least he spelled my name right. Maybe I should explain why I think it's a good idea to provide a custom library along with a book like Think DSP. Importantly, the goal of the book is to help people learn the core ideas of signal processing; the software is a means to this end. The premise of this book is that if you know how to program, you can use that skill to learn other things, and have fun doing it. With a programming-based approach, I can present the most important ideas right away. By the end of the first chapter, you can analyze sound recordings and other signals, and generate new sounds. Each chapter introduces a new technique and an application you can apply to real signals. At each step you learn how to use a technique first, and then how it works. For example, in the first chapter, I introduce two objects defined in thinkdsp.py: Wave and Spectrum. Wave provides a method called make_spectrum that creates a Spectrum object, and Spectrum provides make_wave, which creates a Wave. When readers use these objects and methods, they are implicitly learning one of the fundamental ideas of signal processing: that a Wave and its Spectrum are equivalent representations of the same information -- given one, you can always compute the other. This example demonstrates one reason I use custom libraries in my books: The API is the lesson. As you learn about these objects and how they interact, you are also learning the core ideas of the topic. Another reason I think these libraries are a good idea is that they let me introduce ideas top-down: that is, I can show what a method does -- and why it is useful -- first; then I can present details when they necessary or most useful. For example, I introduce the Spectrum object in Chapter 1. I use it to apply a low pass filter, and the reader can hear what that sounds like. You can too, by running the Chapter 1 notebook on Binder. At this point, anyone who prefers to use NumPy directly, rather than my wrappers, knows how. In Chapter 7, I unwrap one more layer and show how the FFT algorithm works. Why Chapter 7? Because I introduce correlation in Chapter 5, which helps me explain the Discrete Cosine Transform in Chapter 6, which helps me explain the Discrete Fourier Transform. Using custom libraries lets me organize the material in the way I think works best, based on my experience working with students and seeing how they learn. This example demonstrates another benefit of defining my own objects: data encapsulation. When you use NumPy's rfft to compute a spectrum, you get an array of amplitudes, but not the frequencies they correspond to. You can call rfftfreq to get the frequencies, and that's fine, but now you have two arrays that represent one spectrum. Wouldn't it be nice to wrap them up in an object? That's what a Spectrum object is. [...] you don't just write your program down toward the language, you also build the language up toward your program. [...] the boundary between language and program is drawn and redrawn, until eventually it comes to rest along [...] the natural frontiers of your problem. In the end your program will look as if the language had been designed for it. That's why, in the example that makes my correspondent so angry, it takes just three lines to create and add the signals; and more importantly, those lines contain exactly the information relevant to the operations and no more. I think that's good quality code. 1) They demonstrate good software engineering practice, including bottom-up design and data encapsulation. 2) They let me present ideas top-down, showing how they are used before how they are implemented. 3) And as readers learn the APIs I defined, they are implicitly learning the key ideas. I understand that not everyone agrees with this design decision, and maybe it doesn't work for everyone. But I am still surprised that it makes people so angry.